Defending Rights and Dissent is pleased to co-sponsor the fourth annual NATSECDEF conference. This prestigious conference is a meeting of the minds from the fields of law, community activism, religion, national security, and journalism. The relationship between national security and human rights is a delicate balance, as consistently illustrated through the Guantanamo Bay military commissions. 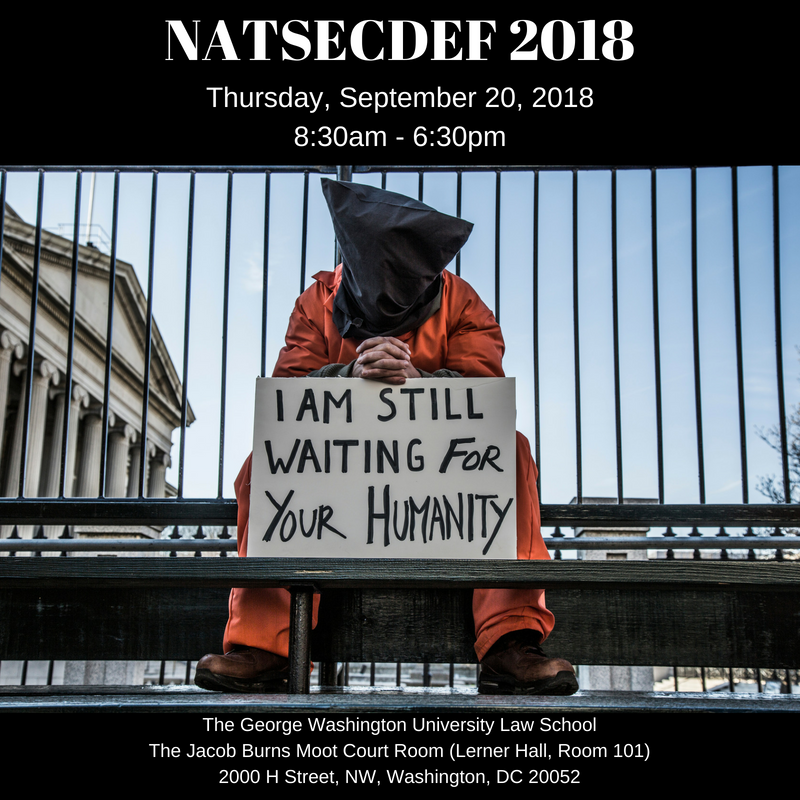 This conference will bring together experts, scholars, advocates, and activists to discuss the most pressing national security issues, how they are being constructed and addressed, and how to maintain the balance between effective security and the human rights protections necessary to a democratic United States. Brigadier General John G. Baker of the Military Commissions Defense Organization (MCDO) will give an overview of current challenges faced at Guantanamo Bay, and examine whether “justice” is achievable through the military commissions. Moderator Jess Bravin of the Wall Street Journal returns to NATSECDEF to lead a broad debate about whether “judicial independence” in counter-terrorism is achievable. Professors Tara Grove (William and Mary) and Marty Lederman (Georgetown, Just Security) will discuss domestic U.S. institutions (federal courts and military commissions), while international criminal lawyer Melinda Taylor (International Criminal Court; counsel for Julian Assange and Saif al-Islam el-Qaddafi), speaking remotely, shares her experience with international tribunals. The opening of a Guantanamo Bay art exhibition in New York in 2017 ignited a media firestorm around indefinite detention at Guantanamo and conditions of confinement at the prison. The Department of Defense reacted to the publicity by ending the detainee artwork program and banning all detainee artwork from leaving the base. Aliya Hussain (Center for Constitutional Rights) and Alka Pradhan (Military Commissions Defense Organization) will discuss the art program at Guantanamo, artwork as a human rights issue, and the effects of new government regulations on those rights. Former Guantanamo Bay detainees Mansoor Adayfi and Abdalmalik Abud will join remotely to share their experiences at Guantanamo and the meaning of expression through art or writing for long-term detainees. Journalist Laila al-Arian (Al Jazeera) will lead an important discussion about the role of Islamophobia in “national security” programs after September 11, 2001. Attorney Hina Shamsi (Director, ACLU National Security Project) will discuss her litigation involving the CIA’s torture program and other “law of war” detention issues, while advocate Dr. Maha Hilal (Michael Ratner Fellow, Institute for Policy Studies; Witness Against Torture) and attorney Deepa Iyer (former Executive Director, South Asian Americans Leading Together; author, “We Too Sing America”) talk about the impact of national security policies on the ground, how the post-9/11 Islamophobia has broadened to a general targeting of minorities, and how people can respond. Judge Patricia Wald – the first woman to serve on the United States Court of Appeals for the District of Columbia Circuit, former judge of the International Criminal Tribunal for the Former Yugoslavia, and former member of the Privacy and Civil Liberties Oversight Board – will deliver the keynote speech on how to pursue and preserve justice in the post-9/11 world.